The governmnet-run offices or buildings are the places where people constantly visit for specific purposes, such as court or simply for pleasures like national museums. With so many people coming around, those places can easily become a target for any malicious attack. To protect the public and its assets with efficiency, the visual clarity of megapixel cameras and data protection of recorded videos are becoming more important to the government security projects. The organizations or buildings built by the government tends to be spacious enough to fill in with the crowds. With so many people and things bustling around sections and outdoor spaces, government needs to rely on a reliable surveillance system to cover every coroner to detect potential threats in time. The harsh weather conditions can be challenging for the outdoor cameras to be able to function properly and record clear images whether during the day or night time. To avoid the loss of confidential data from government surveillance system, the data protection of recorded video is particularly important to the acceptance of government security. Surveon cameras can handle extreme weather conditions, providing excellent megapixel image quality and allow governments to recognize crucial details even under 90%+ humidity environment. With 1.5-time larger monitoring range and equipped 3-axis, Surveon 3 megapixel cameras provide not only greater coverage but also wider shooting angle for area monitoring. 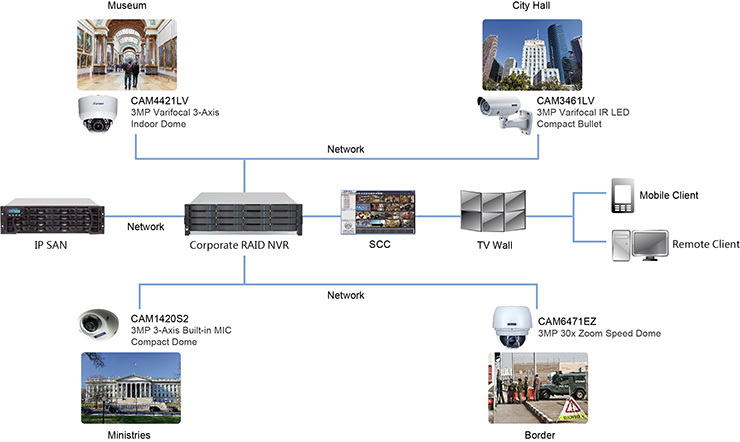 Surveon Smart Search and Playback function of Enterprise VMS enable the governments to search and export large quantities of recorded video which can deal with critical situations in a very short time. 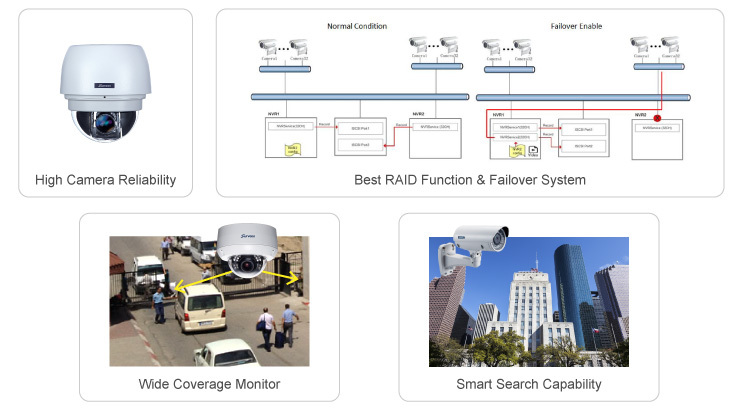 With the premium-grade RAID function and Surveon best C/P failover solution, the protected NVR can be taken over by a failover NVR when it fails, allowing the system to provide continuous recording with no video loss.